Sarah Ross Design is a London based interior design agency, providing our clients with a comprehensive interior design service. Be it a complete structural remodelling or essential refurnishing, we can take you from an empty shell to the finishing touch. We tailor designs to match with your personal requirements and individuality. Our design style combines the contemporary with the timeless. We love including vintage and individual pieces to create designs that are luxurious and comfortable. Whilst there is undoubtedly a thread that connects our designs, each one takes its lead from our clientsʼ taste and lifestyle. We work with clients to interpret and enhance their individual taste and ensure that we create something personal and interesting. Sarah Ross’s aim is to make her clients see things that they may never have thought of, bring them schemes that push the boundaries - but ensure it is a space that they love. Run for the Hills is an award-winning, distinctive West London interior design studio on the banks of the Grand Union canal in W2. Our highly original interior design team and their discerning clients include stylish homeowners, well known personalities, hospitality, media and retail brands. The practice offers a comprehensive design and installation service. The studio designs spaces full of creative touches, juxtaposing vintage classics with next generation design. Their work often includes bespoke furniture and lighting design. Sometimes also including art pieces specially created by Anna in collaboration with her business partner, the graphic artist Dex. Their art is award-winning and the duo also design bespoke furniture, lighting, wallpapers and fabrics. The studio is currently working on a large residential design project, renovating a light-filled apartment set within a grand hotel in Nice. 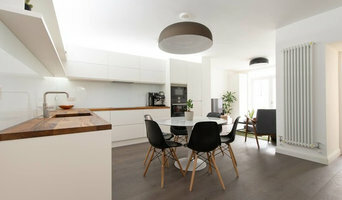 The studio is also designing fashionable properties in Islington, Finsbury Park and have just completed a Notting Hill Villa. Anna and her team have also been designing the private residences of a number one recording artist for several years, in the UK and New York. Their work has been featured in Living Etc, Wallpaper Magazine, On the commercial side, we have designed many coffee shops and restaurants. Recent projects include the design of a boutique Cinema in Bath, with cocktail bar and restaurant, the design of Kricket's new restaurant in the iconic Television Centre development and Scarlett Green, a two-storey glamorous cocktail bar and restaurant in Soho. The studio works across every element of venue design, not just the interior, but also the logo, the menu, the look and feel of the signage, sometimes even the packaging on the shelf and the design of the uniforms the staff are wearing. We believe interiors shouldn’t just be designed to be striking, but planned intricately to make the people using them more productive and happy. Whether that be residential or commercial clients. The key is understanding the Client Brief and helping bring their vision to life in a truly exciting, successful way. And to make sure you have fun along the way! Barlow & Barlow is a British interior design studio known for its dual expertise in decoration and lighting. 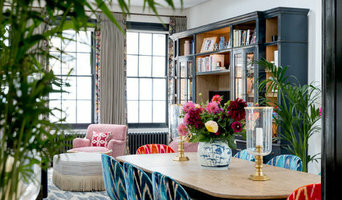 Siblings Lucy and Max Barlow set up the Holland Park practice in September 2013, quickly gaining a reputation for creating spaces that are both youthful and exuberant. One of the few studios to offer a complete interior architecture, decoration and lighting service, it playfully reinvents the traditional English interior for a young and dynamic clientele from London to Dublin & Marbella. Barlow & Barlow’s living interiors are an antidote to the blandness of the instant house look. Its boldly eclectic schemes feature custom sourced art, antiques and bespoke furnishing often designed together with the client. With an academic grounding in fashion and interiors, Lucy designs her schemes with a fearless and luxurious sense of print, pattern and colour. The studio takes a similarly decorative approach to lighting and instils every project with warmth and vibrancy. 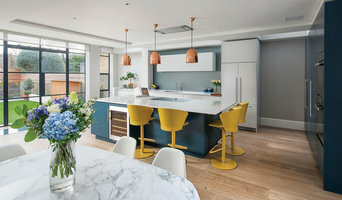 Romilly Turner Interior Design is a North London based studio specialising in creating characterful, original spaces, reflecting the client's personality with panache and style. A passion for mixing vintage pieces with contemporary classics form the basis for all my designs, but the success of a space is only truly realised by the preparatory work involved and it's the rigorous space planning and thorough project management that is at the heart of all my projects. Working with a team of highly skilled creatives, designers and makers, I offer a fully comprehensive and bespoke Interior service, from full home refurbishments to informal consultations to sourcing and styling. I set up Romilly Turner Interior Design in early 2018. Jessie McDonald Design is an award-winning interior design practice based in North London, working on projects throughout London and beyond. Projects range from a single room to entire property build and renovations, and most everything in between. We work collaboratively with our clients to create spaces that are beautiful, inspire and possess character, and that reflect our clients’ personality and lifestyle. We deliver every aspect of a project from the initial design concept through to the installation. Our extensive list of established trade contacts enables you to access products only available to the trade. We have developed excellent relationships with contractors, suppliers and craftspeople who share our passion and keen eye for detail. Jessie holds a Diploma from KLC School of Design and is proud to be Associate Member of the British Institute of Interior Design, promoting professional practice and excellence within the industry. P A S T I C H E was founded from a passion for interior and design by Marion Reynolds. Marion’s Scandinavian heritage combined with her BA in Fashion Design from the prestigious French Fashion Design University, Esmod - create clean, modern, yet timeless interiors that delight in subtle and unexpected ways. Based in North London, Pastiche will help you transform the interior of your property or home using a deep understanding of all things visual, with taste levels that just can’t be taught. We provide bespoke styling solutions for residential properties, with a fresh design ethos inspired by you and your home. We understand that everyone and their home are entirely unique and we have complete flexibility to tailor a package to suit your specific requirements. Visit our website and get in touch today! Based in Wimbledon and working throughout the country and abroad, we design projects imaginatively, thinking about how to best enhance existing features, design new elements, and making creative use of every inch of space -- each room in the house can benefit from a designed approach. A well-designed home can make life more elegant, practical and enjoyable. Clean, well thought out spaces make a difference. Fabrics, textiles and materials can enhance your environment in ways that change how you use your rooms. We have an excellent network of specialists to call on, and delight in making sure that each project meets the needs and desires of the owners perfectly. We approach each project individually, listening carefully to the owners about how they live now and what they are trying to achieve, both now and for the cure. This sets the framework for any project, large or small, and ensures that the result is unique and specific to the individual client, rather than an off-the-peg result. The finished rooms with then work to create spaces that are both beautiful and practical, reflecting the personality, tastes and preferences of the owner and inhabitants. We are experts in coming up with solutions to space and layout challenges, and in translating ideas and inspiration into a tangible outcome. In addition, our coherent approach ensures that costly mistakes are avoided. Our experience and expertise is invaluable both in developing the best design for its purpose, and for dealing with the practical aspects of the entire process. Paper+White is an international award-winning interior design and art consultancy based in London. I serve clients in London and globally. We are well known for creating fresh, stylish spaces for luxury homes and properties. Davina Stanley and her interior design team have a very friendly and personal approach to projects, using the foundations of each building as a canvas and designing each space to reflect the lifestyle and character of every individual client. We offer full end-to-end design and build service as well as creating floor plans/schemes for clients to implement themselves. This includes everything from furniture sourcing, art selection, space management and decluttering. It is our goal to create beautiful, timeless spaces that you love living in. We’d love to discuss your project. 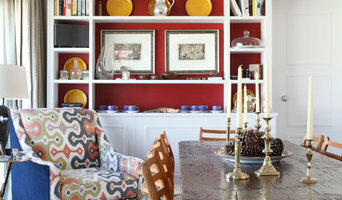 Shanade McAllister-Fisher Interior Design is an interior design studio with a difference; we’re bold and beautiful! We provide a comprehensive residential interior design service from conception to implementation. Our goal is to create homes that make our clients feel comfortable, excited and spoilt! We pride ourselves on tailoring our designs to fit perfectly with our client’s personalities and lifestyles. Whether you wish to refurbish a room or an entire home we will work with you to design and create an unforgettable individual space that epitomises your personality and style. We dare to combine colour, texture, and materials in new ways - you’ll spot our work in the detail; whether that’s expertly integrated artwork, a pair of remarkably handcrafted handles or a one of a kind bespoke bookcase, we always leave behind creative and thoughtful designs that spark conversation! We'd love to discuss your ideas - If you'd like to find out more get in touch for a complimentary consultation to see how we could help. Award winning interior and architectural practise established in 2007. Based London, we specialising in residential projects for private individuals and property developers throughout the UK and abroad. Morphs experience encompasses many aspects of design, with each project representing tailor made collaboration with the client, resulting in an enhancement and realisation of their individual taste through the design. From considered space planning to beautiful styling, we can help improve any property by providing sensitive and original solutions that make each residence work perfectly for the client. The team enjoy designing bespoke cabinetry and fittings to suit clients’ specific requirements as well as providing and procuring a full specification of furnishings and finishes to meet a vast range of briefs. Morph have also previously given advice on the purchase of antiques and works of art, and will happily recommend and visit design fairs with clients to find the perfect finishing touches. In order to get the best for our clients, we also work closely with architects and appoint specialist consultants such as structural engineers, surveyors, audio visual and lighting specialists. M&Y Interiors was established in 1990. From a single house to an apartment block, every property needs its own individual style, and as designers, M&Y tailor make their schemes to match the needs of their clients. Style and budget are the two main considerations and M&Y feel that the finished look should project the ‘wow’ factor required to fit the profile of the property. M&Y work in all areas of London, having completed projects in Bushey, Radlett, Mill Hill, Totteridge, Hampstead, St Johns Wood, Cuffley, Chalfont, Amersham among others as well as parts of Central London and the City. In addition to their regular clients, M&Y have worked with some high profile individuals including those from the world of sports and entertainment. The first meeting takes place at the client’s home where M&Y discuss initial thoughts and ideas as to how they can transform the property. This is a free consultation. The designers at M&Y are also able to offer their expertise advising on tiling, flooring, wardrobes, kitchens and bathrooms as well as meeting with contractors such as flooring specialists, custom made furniture designers etc to assist with the design process. Once designs have been finalised and approved design boards are prepared and presented to client, including computer generated visuals created when needed or requested. Once every detail has been finalised the project can commence. Anything from pointers for paint, fabrics and furnishings to comprehensive moodboards and product lists through to project management of complete house renovations. Freeman & Whitehouse is an award-winning interior design studio, based in Notting Hill. Run by a husband and wife team with decades of experience in interior design and property development, F&W create homes that clients love and manage the process from beginning to end. Our ethos is focused on creating light, airy and relaxing spaces that are functional & unique and our services cover the full project life-cycle including interior-space planning, sourcing, furniture & joinery design, decoration, build and full project management. We have outstanding builders, suppliers, architects and engineers and we design & manage the entire process from start to finish to create an outstanding end product with impeccable eye for detail.